Best Blogger Templates Style - Magnolia is a professional three column Magazine Blogger Template with two left sidebars.The template has a dark color scheme with the main color Green.The template comes with a featured posts slider and four column footer.You can download The Magnolia Blogger Template for Free from BestBloggerTemplates.Net. awesome template i will use it on my blog thanks. 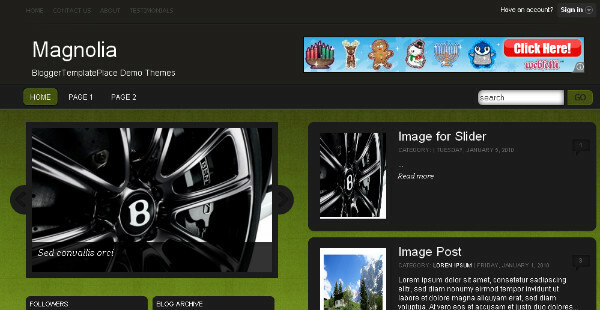 Wonderful template thanks for sharing i am using this on my Blog now and my blog seems great.. Thanks for sharing these kind of stuff..